In our arsenal of shop tools, gadgets and jigs, there is sometimes a tool that we seldom use. But when we do use it in one of our projects, we quickly realize that this is precisely why we purchased it and it proves to be worth every penny. The Duo-Mite 55000 Metal Bender Tool (Photo 1) manufactured by Oxford General Industries (OGI) is such a tool. 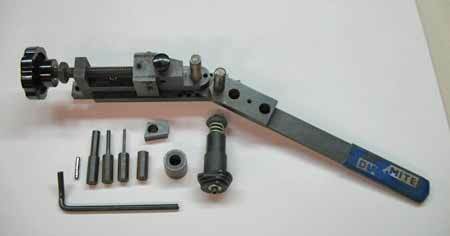 Photo 1 — Overall picture of the Duo-Mite Bender with attachments. This bender kit was purchased in 1995 and the manufacturer now offers three models with a slightly different variety of attachments than was available when we bought our machine. Located in South Western Connecticut, OGI is a multi-faceted, precision manufacturer offering CNC and other machining services. Along with their services, they offer three versions of metal benders, the 50000, 54000, and 55000. All three models start with the basic vise jig and add various attachments and gauge pieces for different applications or trades (Photo 2). Photo 2 — A closer view of the Duo-Mite Bender. 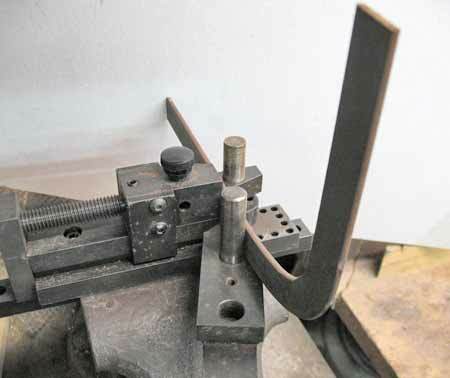 The main clamping vise holds the round or flat stock while the pivoting arm will force the metal stock around round dowels for gentle bends or square edges for more sharp bends. 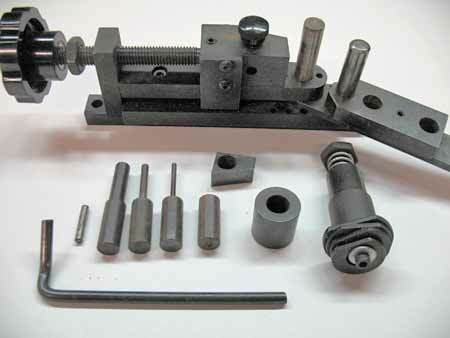 Shown are the round dowels, pin jigs, the long rod used for a length gauge when making duplicate pieces, and the edge bender used for forming curves on flat stock. They are sturdy for fabricating automotive and heavy hardware brackets, yet can be gentle enough for artisans for use in the jewelry trade. The benders can handle metals up to 5/16" round or 1/8" X 3/4" wide flat stock. As a review project for the Duo-Mite 55000, we wanted to design and fabricate mounting brackets for a heater to be attached to a car's firewall. Our firewall had already been removed from the car body during our ground-up restoration process, simplifying this project. The heater has a stamped metal shell which will house a heater core with an electric fan behind it. We supported the metal shell with wood blocks to allow us to determine exact location, overall fit and verify that there was no obstruction with other firewall mounted hardware. It was important that we avoid making any new holes in the firewall, so existing mounting points had to be considered in the bracket design (Photos 3 & 4). Photo 3 —The firewall is laid flat on the table and the heater's metal shell is temporarily supported by wood blocks to determine the best fit and to show that there was no obstruction with other firewall hardware. Photo 4 — Side view of the project on wood blocks with the first bracket temporarily held with a C clamp. This allows further adjustments and measurements before making the more complicated edge bent bracket. We determined that two brackets would be needed for this heater project: a lower, simple L bracket and a more complex L bracket with a edge bend. 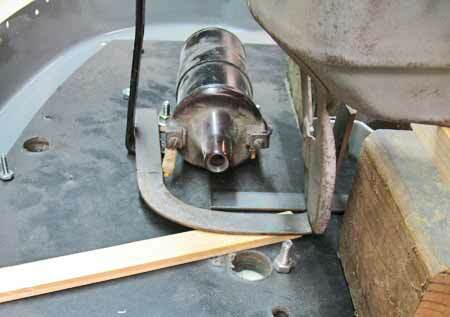 Our goal of using existing holes meant bending the mounting bracket around the ignition coil. 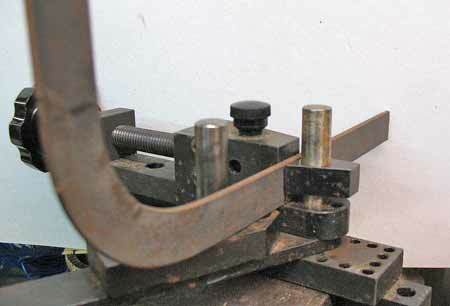 The easiest bracket to make and fabricate was the lower bracket with a single sharp bend. Photo 4 shows this bracket being fitted prior to welding and hole placement. 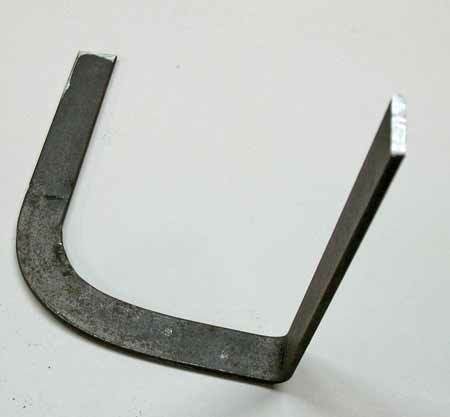 Bending of this bracket in the Duo-Mite ending tool is shown in Photos 5 and 6. This is the simplest type of bend the Duo-Mite can handle. 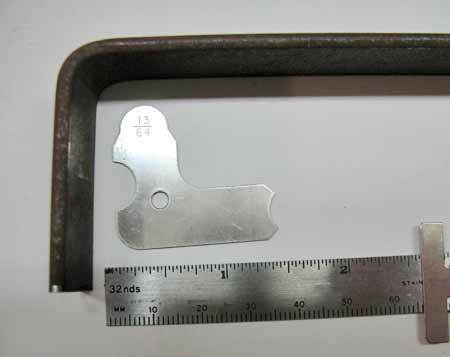 Photo 7 shows a radius gauge of 13/64 inch for the inside bend. Photo 5 — The simple 90 degree L bracket is bent first. 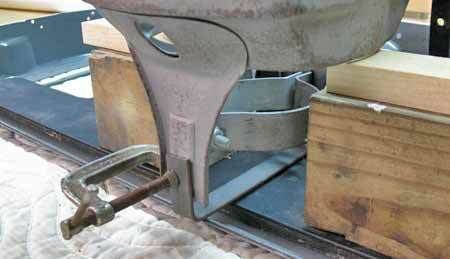 1/8 X 3/4 inch metal stock is levelled and held in the Duo-Mite's vise. 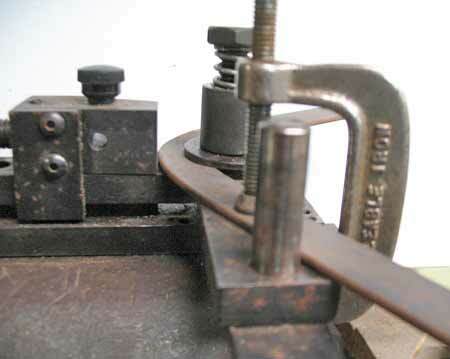 Included is the wedge accessory in the vise's large round pin which assists when making a sharp bend. Another large pin is mounted in the pivoting handle. The closer the pin is to the work piece the shaper the bend. The Duo-Mite offers multiple pin positions for various tasks and shapes. Photo 6 — Close up view of the tapered metal block attachment. This block can be used in the vise (shown) for a sharp edge bend or mounted on the pivot arm dowel to form bends in tight spots. 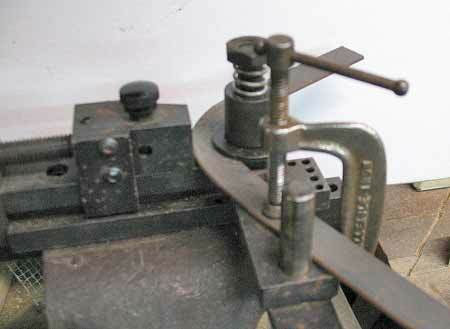 Also shown are the smaller holes in the vise's base which can hold the smaller diameter pins used for bending stops (useful when making multiple brackets of the same shape). Photo 7 — The Duo-Mite Bender showed to bend 1/8 X 3/4 inch flat stock with an inside radius of 13/64 inch. While not performed in our demonstration, thinner stock would allow for a sharper bend. 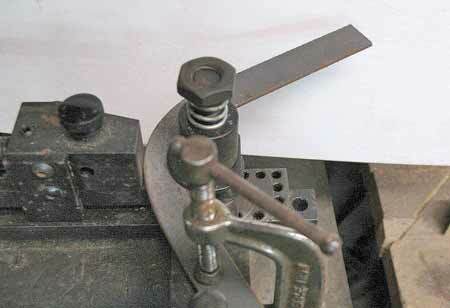 Photo 8 — The Duo-Mite bender base (vise) is fitted with the edge bender attachment and held in the shop vise. 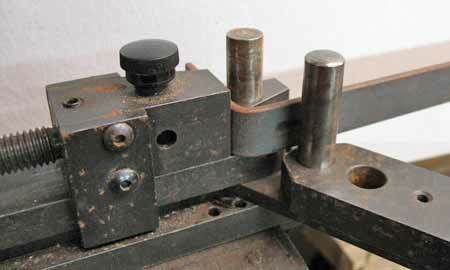 1/8 inch X 3/4 wide flat metal stock is inserted into the bender and locked down. The pivot arm, assisted by force on the metal stock, forms the metal around the edge bender radius insert (washer). Since the upper bracket was more complex, we had to make a template out of cardboard in order to accurately determine its dimensions. We reconfigured the Duo-Mite Bender for the edge bender accessory and the 1/8 X 3/4 inch flat stock is tightened in the vise clamp. 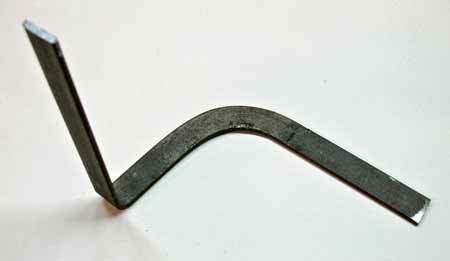 Considerable pressure is required to make this bend and some kinking was experienced during this bend but was quickly solved with the aid of a small C clamp (Photo 9). Thinner gauge stock may have made kink-free bends and applying heat may also have made this bend easier. Photo 9 — Closer view of the edge bender attachment. 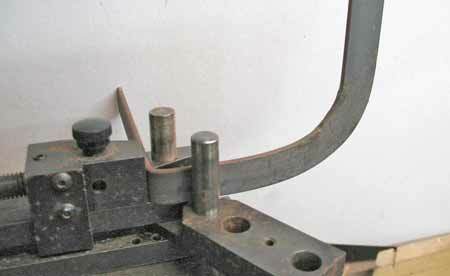 As the flat stock was formed some kinking started to appear and a small C-clamp was employed to keep the metal down during final forming. We were satisfied the Duo-Mite did the job as advertised. It is good to check the bend's progress with the cardboard template (Photo 10). Once we were satisfied the edge angle was right the Duo-Mite was reconfigured for the regular bend (Photos 11 & 12). Just as the edge bend angle required checking, so does the regular bend. Photo 13 illustrates the Duo-Mite's ability to make sharp bends with the available pin-hole locations on the Bender's handle. While not all tasks require sharp bends, it's nice to know the tool can perform these tight bends. Photos 14 & 15 show this upper bracket as it was removed the bender and Photos 16 & 17 show it being fitted against the firewall. As with any project of this kind, some finessing, filing and sanding is required before final finishing. 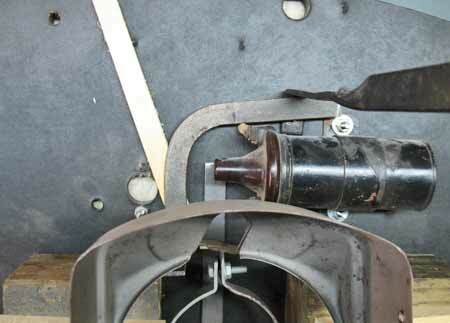 Photo 10 — Overall view of the flat stock being bent. 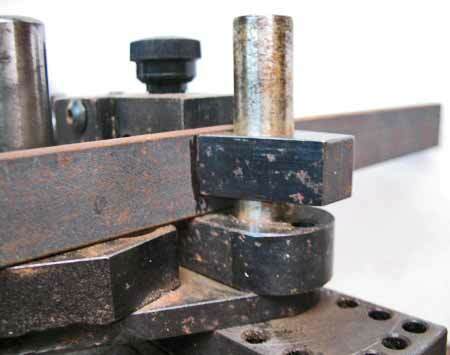 Good measuring points on the flat stock will aid in the bending progress. We would recommend removing the work piece for trial fitting until you are sure that the piece fits correctly. Photo 11 — The Duo-Mite bender was reconfigured without the edge bender attachment and the edge bent bracket was configured for a sharp bend. Photo 12 — Close up view of the edge bent bracket and the wedge block on the inside of the bending radius. Photo 13 — Progress view of the edge bent bracket being bent around the wedge block. The large hardened pin in the pivot handle makes a nice sharp bend. Photo 14 — Overall view of the edge bent bracket. The lengths after the bends can be cut down as needed. Photo 15 — Another angle view of the edge bent bracket. 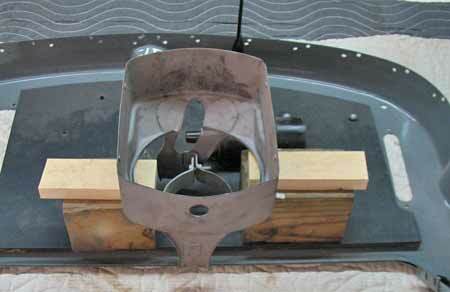 Photo 16 — The edge bent bracket is fitted on the firewall for shape and hole location. Photo 17 — Side view of the edge bent bracket being fitted on the firewall. Summary. The Duo-Mite Bender is a heavy duty and rugged tool useful for making many shapes and forms of metal brackets and hardware. 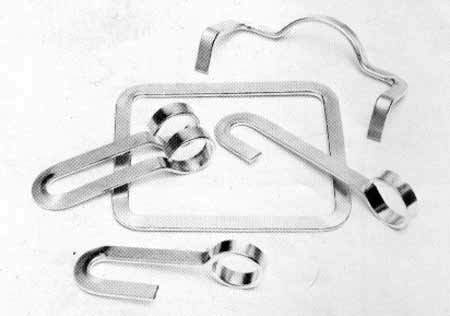 Examples of products that can be made are eye bolts, Circles, coils, loops, "S" hooks, bracelets, and brackets requiring close following radius and bends (Photos 18 & 19). Applications can range from Automotive, House Restoration and Artesian Crafts. The OGI website offers a complete listing of the Duo-Mite products, accessories and complete instructions (too numerous to list here). 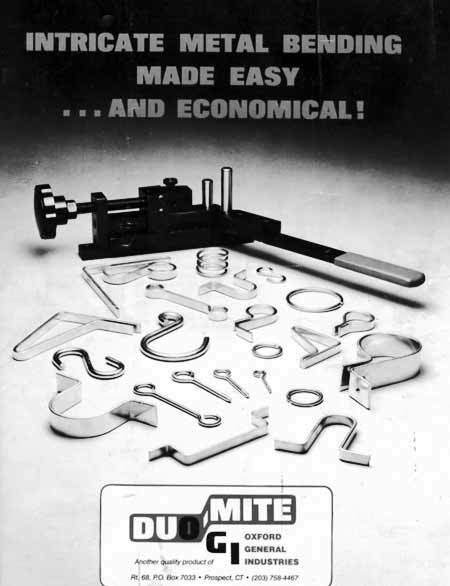 Photo 18 — Brochure of the Dou-Mite Bender showing many examples of the products that can be produced. Photo 19 — Additional examples of brackets that can be fabricated using the edge bending accessory.